something borrowed and something blue." That tradition goes way back and links the bride to family and faithfulness. Well, here is something definitely borrowed. 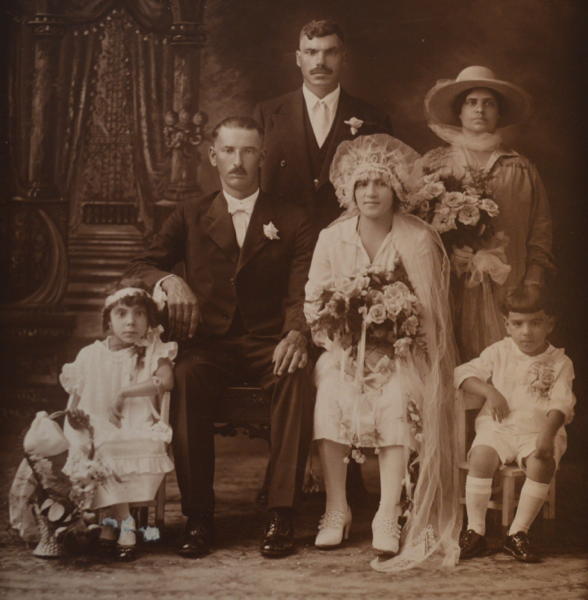 This post, Part I of three, traces the history of weddings in the Village. The photographs come to us courtesy of Arlene Gouveia whose mother kept many, many precious photographs that are enriching our memories in this blog. Lesson to be learned for all of us. Through the help of Arlene's son, John, these have become part of a lovely history of weddings in the School Street Village. When I first received them via e-mail, I sorted them along with others from my own Souza-Bento Correia genealogical files. Along with many of the photographs are stories that often charm, sometimes sadden, and always bring the pictures to life. To add even more, one can extrapolate these stories and their photos to a history of weddings in America through the years. For the most part this is a chronology with some departures here and there. Researching the history of weddings in general I was amazed to find how the photos correlated. Come along for this ride and do not be surprised if you hear wedding bells from the past. The first weddings took place in 2,800 BCE with the first recorded use of the wedding finger band. In 1659, the most expensive wedding gift ever was bestowed by King Charles II to Queen Luisa of Portugal. It consisted of the two cities of Tangiers and Bombay! The word matrimony comes from the Latin: matrimonial is derived from mater or mother. Weddings changed over the years from "catch and capture"
to more romantic and religious events. Our first couple dates all the way back to 1891. Predating the establishment of St. Anthony's Church in the Village in 1906, Jose Rosa and Flizbeta (Flora) Rose were married at St. Mary's Church in Taunton in 1891. It was only in the 1870's that the use of diamond rings was started, and also the use of photo albums as in those years Kodak came on the scene. Everything about the photograph bespeaks simplicity and few "bells and whistles" Both man and wife are austere and unsmiling. The times were difficult for many newlyweds and strength would be needed. The honeymoon destination Niagara Falls become popular around 1860. 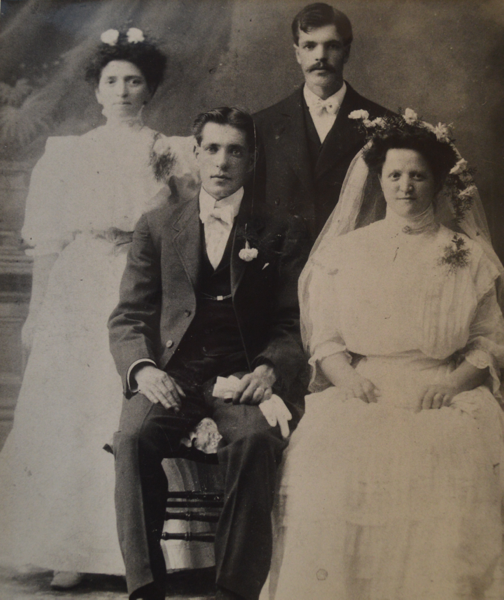 Below my maternal great Aunt Anna Bento Correia and her husband, Jose were married in 1901, probably in Bristol, RI at the Portuguese Church of St. Elizabeth. Note her Victorian hairstyle and the full sleeves which characterized the wedding gowns of the time. Times have begun to change, in at least style. This gentle woman, Tia Annie to us, was my grandmother Isobel's sister. Her husband Jose and her two oldest children would die prematurely in the Azores leaving her a young widow in her twenties. Returning to the U.S. with her two remaining daughters, she would marry Mr. Fostin in the Village. They would settle in a little white house right next to Jigger's Variety just off Braga Square. She lived there until her death in 1958. Her home which was very familiar to us, provided us with easy access to Jigger's and a view to the happenings of the Village at that end of School Street including Fourth of July celebrations. 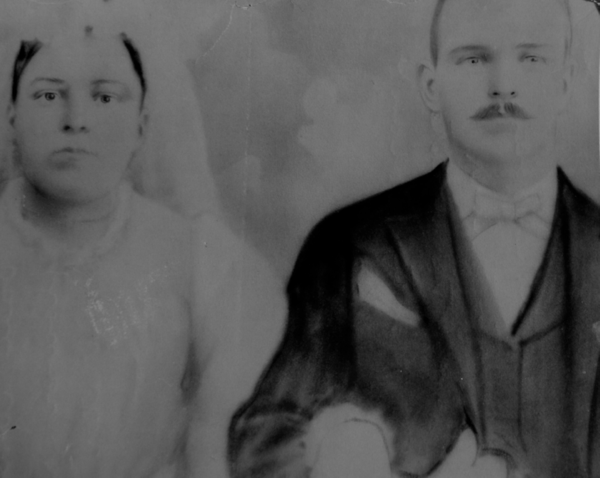 This next photograph is of Mr and Mrs Jose Luiz Perreira (Maria de Camo Moniz Morgada) married in New Bedford in 1908. For awhile floral headdresses were the rage. One still sees that Victorian hairstyle, the nipped waistline and the puffed sleeves. Our groom here is sporting white gloves. The wedding gown color is still high encircling the neck. But, at least the bride is smiling. and the maid of honor are very similar. Way back in time, this was done on purpose so that evil spirits would be confused as to who as who, or marauding men would not steal away the bride. Look at the veil. The history of the wedding veil goes way back in history. It also harkens back to Sephardic Jewish history in the Iberian peninsula. Keep in mind that there was a strong Jewish presence all the way back to the Romans in Portugal. I do not know if there was such a bloodline in our family, but all is possible. At the least there was a cultural heritage. To me this veil has Sephardic overtones as it nearly overwhelms the dress and even, the bride herself. Also, even prior to that tradition, it was thought that the veil protected the bride from evil spirits. In the case of arranged marriages it hid the bride so the groom would not change his mind. Tia Annie seen in an earlier photograph. recessional: the Bridal Chorus from Wagner's Lohengrin. Most brides wore them until around 1910 when a spirit of new freedom seemed to begin. The style is still demure but the skirt is a lot shorter. 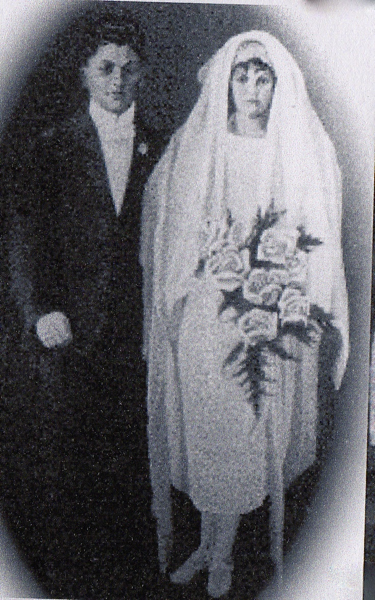 Mr, and Mrs. Joseph Silvia (Mary Rose) were married at St. Anthony's Church. carrying a bouquet of dill and garlic to ward off the Plague. Over time the tradition changed to flowers with their own meanings such as roses and baby's breath and forget-me-nots. Not long after this, in 1924, the bridal registry was born at Marshall Field's in Chicago. after their wedding at St. Anthony's in 1927..
Uncle Joe was a long time custodian at Fuller School. Their late son, Joseph, was a great help to me in my genealogical research and we often talked and shared discoveries. He provided one of the all time exciting moments for me when one day I was visiting him in Taunton. He said to me, "I have been waiting for years for someone to ask me for this….." He then put into my hands my great grandmothers original passport dated 1922.
because once it was "get a piece of the bride of the bride's gown." sedate practice of throwing the bouquet came into vogue. Ah, the whole bridal party here. Our bridal cap is quite ornate and the neckline a bit more daring. 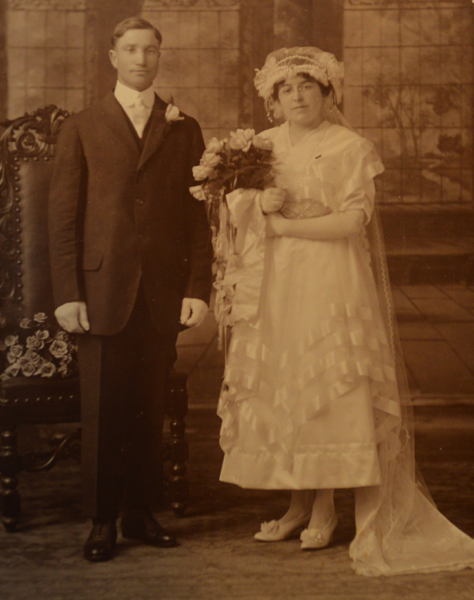 Mr. and Mrs. Manuel Gonsalves (Mary Gallego) were married at St. Anthony's Church also in 1927. They are Arlene Gouveia's husband's paternal grandparents. The flower girl is Mary Tremblay and the ring bearer, Sam Sousa. 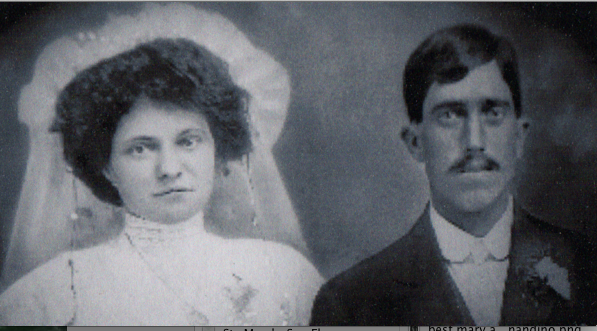 Now we see a lovely smile on our bride's face which was "frowned" upon in former years. Our small flower girl's headpiece is definitely the 20's look. Also, see her sleeker wedding dress. The history of flower girls goes back to Roman times, then they carried sheaves of wheat and herbs to ensure blessings of prosperity and fertility for the couple. Ring bearers go back to ancient Egypt when it was the custom to carry treasured jewels on ornamental pillows during wedding ceremonies. as we stroll through the years. Meanwhile: wouldn't you like to share some of your wedding photo heirlooms with us? Just wonderful. I have some black and white weddings also of my grandparents and aunts. I grew up on Purchase St. during the 50's and 60's. I now live in TX. Miss the culture, foods, and believe it or not the weather. I look forward to your net blog. I have tread this word for word - and the wedding pictures so very interesting as someone from the village who loves reading your blog. so far, this is my absolute favorite! Can't wait for Part II ! 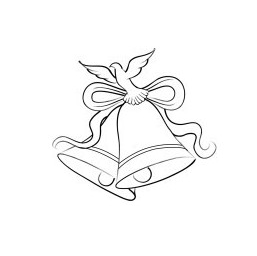 I enjoyed all 3 installments about weddings in your blog! When I get a chance I'll send along my parents' wedding picture (1938, their honeymoon was spent viewing the wreckage from the hurricane all over New England). Thank you and keep up the good work! Thank you, Joan. Appreciate your good comment. I look forward to getting your parent's wedding photo, I will surely publish an addendum to the three posts.